Level 3 - Advanced tour bikers: extended and frequent climbs and longer daily distances. For experienced bikers in above average physical condition - sportive tours. Look forward to this sail & bike tour through Tuscany and its breathtaking scenery. Cycle in the foot-steps of the Etruscans, and enjoy the Italian ‘Dolce Vita!’. Cypress trees, wine fields and olive trees spread across the rolling hills characterizing the typical Tuscan landscape. Picturesque medieval towns with small cobbled streets and colorful houses invite curious visitors. Beautiful sandy beaches and remoted bays beckon for a swim in the glistening blue water. Daily tours in hilly terrain at distances of 15 - 24 mi./25 - 40 km and 2132 – 3937 ft/650 - 1200 m of eleva-tion. The terrain ranges from hilly to mountainous with single trails at varying levels between S2 and S3. The diversity of the riding is as diverse as the landscape of the islands and mainland and requires a good physical condition. The bike tours take place on all kinds of roads, paths, trails and natural ground; there are very few unrideable points. Helmets are mandatory on our bike tours. It is advised to bring your own, well fitted, helmet with you as our rental helmet numbers are limited (reservation required). Furthermore, we recommend riders to carry arm and leg protectors during the bike tours. The daily program depends on the weather and the captain’s orders. You are free to set aside a half or full day to spend on board the boat, instead of taking a planned bike-tour. Individual arrival in Porto St. Stefano, a wonderful, lively harbor town on the northern side of the Monte Argentario peninsula. Boarding the boat takes place from 6pm onwards. Should you arrive earlier, you are welcome to leave your luggage on board from 2pm onwards. With a short stroll through the medieval old town, painted in a wash of pink and beige, you will quickly realize that you are now on holiday. Additionally we can recommend a walk to the Fortezza Spagnola, built in the 17th century as a means to pro-tect the city, it rests on the hill above the old town. The first evening meal on board is a great way to get to know your fellow travelers, guides and crew. Overnight in Porto St. Stefano. The Island Giglio lies in the far south of the Tuscan Archipelago and is a true gem. Mountains, forests, untouched nature, crystal clear water! 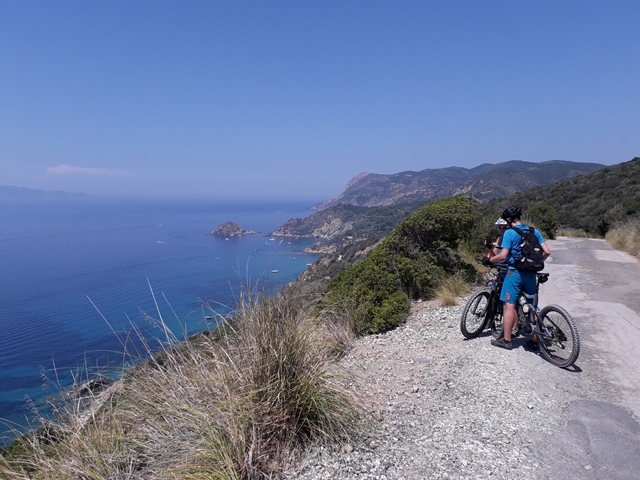 Today’s tour offers us a challenge with a great reward as we ride from Giglio Porto to the central town of Giglio Castello – surrounded by an impressive medieval town wall. A rapid descent takes us to the other side of the island to Giglio Campese where the local sandy beach invites us for a splash. A switch back serpentine leads us back to Giglio Porto. Enjoy the last cruise on board the Atlantis as you set sail in the direction of Porot Santo Stefano. A celebratory evening meal in the company of fellow travelers, crew and guides offers a great atmosphere in which to enjoy the last evening together reflecting on the week. We reserve the right to make changes to the itinerary, depending on wind and weather conditions or organizational requirements. Depending on the direction of the prevailing winds, this tour can also take place in reverse order. Helmet use is mandatory on all cycle tours. You are strongly encouraged to bring your own (well-fitted) helmet. Cycle helmets are available on board in limited number (on request). Welcome on Bord the Tallship ATLANTIS ! At 57 x 7.5 m, 14 sails and over 750 sqm sail surface the Atlantis is a guaranteed eye catcher in every har-bour. Built in 1905 and christened Elbe 2, the Atlantis served faithfully as a light vessel in the North Sea, Germany. Afterwards she was elaborately restorated as a tallship for passenger cruises. The renovation featured a classy salon, a spacious upper deck including seats and a cocktail bar as well as 17 comfortable air conditioned guest cabins including a shower and toilet. The unique charm of the Atlantis is due to the loving care of the inventory and to a helpful and greatly experienced crew. The 17 cabins of the Atlantis offer space for up to 34 guests. All cabins are equipped with two seperate ground-level beds as well as private shower and toilet. The cabin's interior is convenient and elegant. It provides enough space for storing your luggage and gives the cabin a maritime atmosphere. Central heating and air conditioning is available in every room. This tour includes half board. Due to the differing daily programs, some days will have no warm meals included while others will include both lunch and dinner on board. Breakfast is available on board every day. 46 cm and 52 cm for ladies, 56 cm and 60 cm for men). Please be informed that we are only able to offer rental bikes starting with a body height of 150 cm. Please Note: If you won´t be without your own saddle (without the post) or your own click pedals, please bring them with you and let your tour guide attach them to your rental bicycle..